BizDart is a mobile+Web CRM product for easier Lead/ Service Request/ Product Enquiry Management. The simple yet powerful app is designed to ensure that your business gets better results through tracking of every single lead and following up on opportunities dligently. BizDart uses Getting Things Done [GTD] principles to help you convert leads to customers, reach sales targets, manager service requests or enquires and grow your business fast. The current state of CRM shows that many businesses are struggling to implement a CRM solution that has worked for them. This is because most of the CRMs are �Gold Plated� with a number of modules/features that the business does not need. Therefore using a standard CRM reduces your productivity by diverting you from your primary goal of acquiring new customers. This frustrates Business owners and Salesforce. BizDart uses a �Getting things done� (GTD) framework for organizing and tracking your tasks, activities, and milestones. BizDart offers you a foolproof system for keeping track of what you need to do, should do, or should consider doing. When your system and your trust in your system is in place, your subconsciousness will stop keeping track of all the things you need to do and stop constantly reminding you. This reduces stress and frees up precious brain time to engage in more productive thinking. 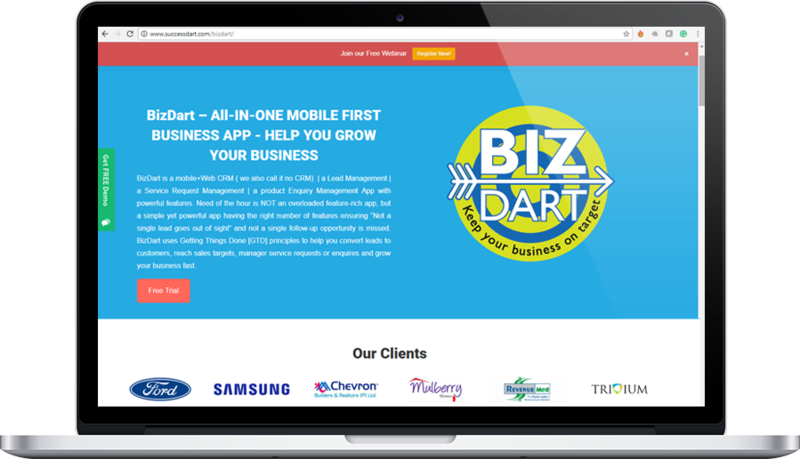 BizDart is the perfect match for small businesses ranging from 1 to 1000 employees that need an innovative solution to help them streamline and manage/monitor their sales/field staff. We help them to convert most of the paper trials to a digital solution and business owner can track the performance of the business on the go! Our cloud solution requires no software installation or maintenance. Your account is accessible anytime, anywhere.